Henry Ludwig-1 was born in 1818 in Hessen, Germany. He married Maria Schmidt.She was born in Aug 1818 in Germany. Peter Ludwig, B: 1845 in Luxembourg, D: 12 Dec 1891 in Prairieville, Brown, Minnesota. Peter Ludwig-2(Henry-1) was born in 1845 in Luxembourg. He died on 12 Dec 1891 in Prairieville, Brown, Minnesota. He married Eva Kiefer, daughter of John Kiefer and Anna Mary Schmitz. She was born in 1847 in Germany. She died in 1872 in Belgium, Wisconsin. Mathias Ludwig, B: 31 Jul 1868 in Holland, Brown, Wisconsin, D: 25 Mar 1951 in Nicollet, Nicollet, Minnesota. John Ludwig, B: 1866, D: 1944. Peter Ludwig, B: 1869, D: 1869. Mary Ludwig, B: 1871, D: 1951. Mathias Ludwig-3(Peter-2, Henry-1) was born on 31 Jul 1868 in Holland, Brown, Wisconsin. He died on 25 Mar 1951 in Nicollet, Nicollet, Minnesota. He married Anna K. Schiltz, daughter of Frank Schiltz and Mary Vrtes. She was born on 31 Aug 1872 in Minnesota. She died on 17 Apr 1940 in Brown, Minnesota. Leona Ludwig, B: 23 Nov 1899 in Leavenworth, Minnesota, D: 16 Jan 1958 in Sleepy Eye, Minnesota. Frank Ludwig, B: 1891, D: 1914. John Ludwig, B: 1892, D: 1971. Mary Ludwig, B: 1895, D: 1953. Raymond Ludwig, B: 1897, D: 1970. Ursula Ludwig, B: 1901, D: 1901. Elizabeth E. Ludwig, B: 1903. Loretta E. Ludwig, B: 1906. Nickolas E. Ludwig, B: 1908, D: 1976. Hillarius Joseph Ludwig, B: 1910, D: 1986. 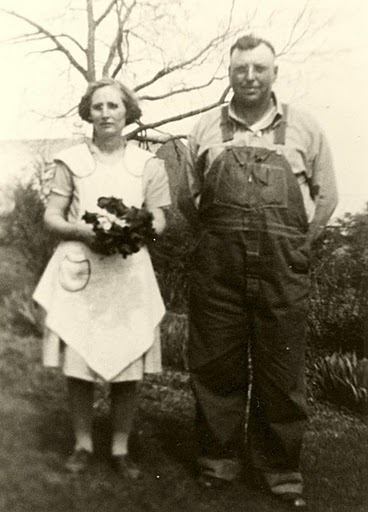 Leona Ludwig-4(Mathias-3, Peter-2, Henry-1) was born on 23 Nov 1899 in Leavenworth, Minnesota. She died on 16 Jan 1958 in Sleepy Eye, Minnesota. She married Joseph Stephen Huiras, son of John Baptist Huiras Jr. and Barbara Holm. He was born on 26 Dec 1896 in Leavenworth, Minnesota. He died on 30 Jun 1966 in New Ulm, Minnesota. Eulalia Gertrude Huiras, B: 1935, D: 2003. Odelia Barbara Huiras, B: 1921, D: 2003. Eugene Joseph Huiras, B: 1926, D: 2009. Melvin Edwin Huiras, B: 1927, D: 1981. Victor Ervin Huiras, B: 1921, D: 1972. Joseph P Huiras, B: 1930, D: 1991. Marlee A Huiras, B: 1934.